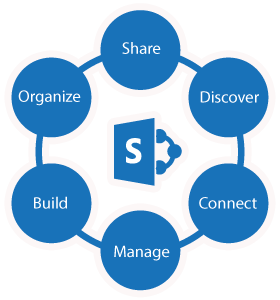 SharePoint is a robust business platform that can help your organization become more connected, more organized and more efficient. SharePoint is . . .
A Document Collaboration Platform – perhaps the most common use of SharePoint, it is one of the most cost efficient document collaboration tools on the planet. Right out of the box, SharePoint gives you real-time coauthoring, versioning, powerful search capabilities, drag & drop bulk uploading and much more. An Enterprise Search Tool – find documents, pictures, presentations, people, projects, teams, and even line-of-business data. The search engine is fast, powerful and can be easily customized with little to no code to allow people in your enterprise to find content fast. A Business Process Optimization Tool – use the underlying Windows Workflow Foundation to automate document approval processes or send email notifications. A Staff Directory – search for people within the organization to find their title, location, manager(s), bios, and even expertise on a particular subject area. A Platform for Building Power User Solutions – perhaps the most underrated capability of SharePoint is as a platform for building no-code applications. An Extension of Office – connect tasks or calendars to Outlook, modify document Metadata stored in SharePoint through Word, synch SharePoint list data in Excel. SharePoint is commonly implemented, but rarely is it fully leveraged. Many organizations simply don’t understand everything that SharePoint can do, nor do they have the resources to make it happen. Auptimal has experience with SharePoint migration and implementation across industries and can help with your SharePoint needs.